Black, shiny, homogeneous, breaking with a conchoidal fracture. 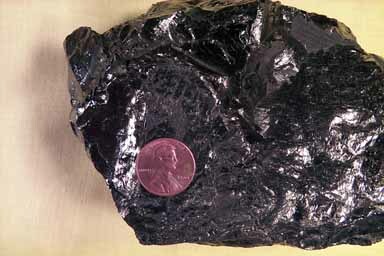 Anthracite coal forms when bituminous coal undergoes very low grade metamorphism, accompanied by structural deformation. The fixed carbon content under these conditions reaches 85-95%. If anthracite is metamorphosed further it turns into graphite.